I'm sitting next to my computer with a countdown on the screen. My hand is hovering over the green button. My roommate is standing beside me for moral support. It hits 11:50 and, lightening fast, I press the button, holding my breath, praying that I was quick enough to register for classes before they all close out. 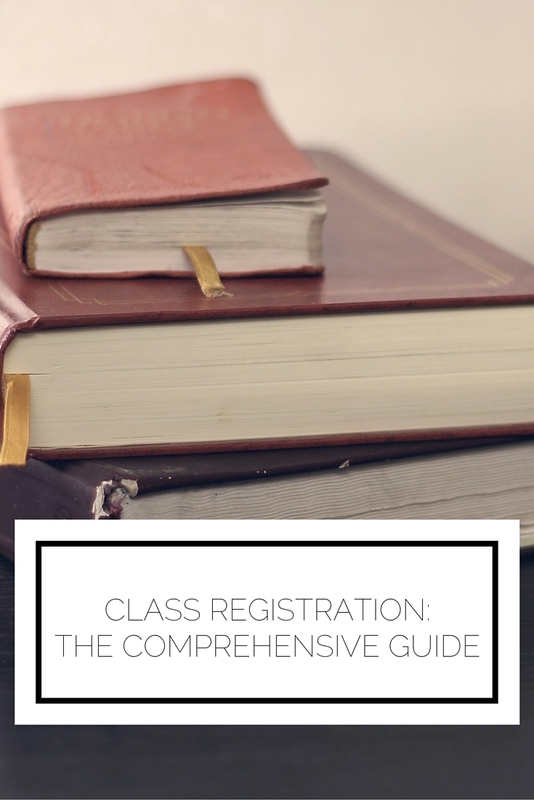 From figuring out which classes to register for, to watching them slowly close out leading to your registration date, to that fatefully moment when you find out if you got your ideal schedule or have to start from scratch, registration can be stressful. I'm here to give you a comprehensive guide so you can prepare properly and be ready to go when your time slot arrives! This is so, so, so important. I truly can't stress it enough! Visiting with your advisor will give you the opportunity to clear up any confusion you have of which classes you have to/should take and you can even learn about the miracle which is double counting. Getting that clarification is key to a smooth registration. As with any meeting, be sure to be prepared going in. Your advisor does not have endless time so don't expect him or her to do all of the work for you. Do your research before so you know what questions to ask, figure out your major requirements, and look up the suggested sequence of classes. This will show your advisor you respect his or her time and will make them more willing to help you as well as increase the chance of having a productive meeting. Make contingency plans. Lots of them. Once you know what courses you want to take, you can start identifying the different times available and create your ideal schedule. Now, I hate to be the bearer of bad news, but the likelihood that your ideal schedule is still available by the time you go to register is slim (unless, of course you have the first time slot in which case, lucky you). Since this is the case, you have to have backup plans. I like to map it out on a piece of paper and rank the schedules I prepare. A good number of options to shoot for is between 3 and 5. As you check back in leading up to your registration date, you can make adjustments. To me, the time and day of the class is what's most important, but many of my friends are very particular about which professors they will take. They like to visit Rate My Professor to get reviews from other students and decide who they are most willing to take. If this is a major factor to you, be sure to make that part of your contingency plans. On the day of registration it can be all too easy to go into a panic, convinced that you'll never be able to take the classes you need, and are doomed to graduate years late. Let me assure you, this is not the case. If in the event you do not get into the classes you need you can always email the professor or chairperson of the department, explain your situation, and figure out how to address the issue. This is another instance in which your advisor can come in handy. What advice do you have for class registration?